It felt time for another giveaway :) So this autumn, I'm giving away a few Accessorize Diamond Sparkle Lipglosses. 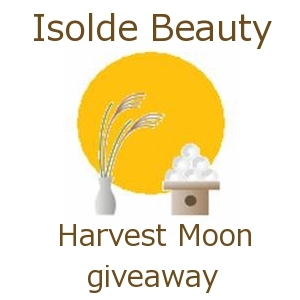 My inspiration for the giveaway is the September moon also known as the Harvest Moon which will be full this year on September 29th. The Harvest Moon is the moon closest to the autumnal equinox and is (as the name implies) associated with the harvest season. Due to the positions of the earth and the moon, the moon rises early around the equinox, supposedly assisting the farmers by giving them light after the sun has set. The Harvest Moon is also celebrated in many Asian cultures - this time of year features Autumn moon festivals. The Mid-Autumn Festival is celebrated by Chinese cultures by indulging in mooncakes (a type of heavy pastry), matchmaking, lighting lanterns, and dragon dances. The Chinese Goddess Chang'e is also central to this celebration. Chang'e lives on the moon along with a hare (rabbit) and together they pound medicine, rice cakes, or mochi (depending on the legend). Sadly I don't have the same sway as Chang'e, but what I can offer, my dear readers, is a some lovely Accessorize lipglosses. These are lovely sparkly lipglosses with a scent of vanilla - check out a review over at For the Love of Lipstuff. Use the Rafflecopter below for your chanc'e to win. I'd shamefully never heard of this before! I linked you in my Lipstuff blog. I love this stuff! I am so excited for someone to win! Thanks, DJ! I'm glad you like this so much! I love the sparkles in these babies. We always take a good look at the Harvest Moon...it's so huge and has a really awesome color over here. Kind of reddish-orange. It's a bit eerie! I hope it doesn't disappoint!